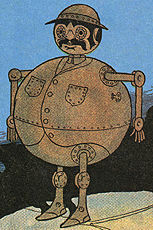 L. Frank Baum was the first English-language author to write about sentient mechanical beings ranging from cyborgs to robots. 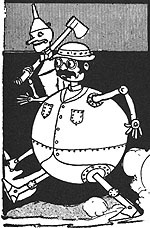 At the turn of the last century, however, neither "cyborg" nor "robot" had yet been coined; Baum's characters went by their proper names or descriptive terms such as "machine man." Fantasy was already a recognized genre, but stories that would now be described as science fiction were called "Edisonades." Long before George Lucas was born, Baum was placing science-fiction characters in fantasy settings. The Witch of the East cast a spell on an axe owned by a woodman named Nick Chopper. Each time the axe was used, it would cut off a part of Nick's body. A mysterious tinsmith named Ku-Klip replaced each severed body part until Nick was made completely of metal. Technically, the Tin Man is not a robot but a cyborg— and a veritable showcase of successful biomechanical transplant surgery! The Mechanical Man was built as a servant for King Evoldo of Ev, who named it "Tiktok" because of the noise it made when operating. Just before the King's suicide, Tiktok was locked in a room, where he was found much later by Dorothy Gale of Kansas. "Is he not a great work of art?" The Iron Giant with the Hammer, like Tiktok, was constructed by Smith & Tinker at their factory in the town of Evna. The Giant's purpose was to guard a ravine that was one of the very few paths to the Nome King's underground palace. Ozma of Oz, with an entourage that included Dorothy Gale, once journeyed to visit the Nome King. They were able to circumvent the Giant with the Hammer by determining how long it took for the massive mallet to be raised and then strike at a target on the ground. When the mighty iron sentry began to raise its hammer, the party slipped through between the Giant's feet. 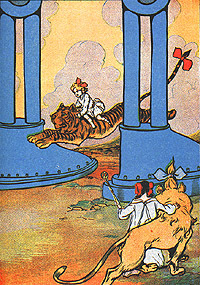 At right is Dorothy on the back of the Hungry Tiger. In the foreground is Ozma with the not-so-Cowardly Lion. 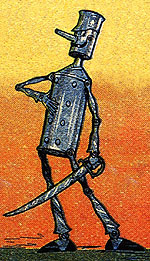 A near twin to the Tin Man was Captain Fyter, Tin Soldier of Oz. AND it's a fun read!